Grind 4-5 cleaned prawns to a paste and keep it aside. Marinate remaining cleaned prawns with chilli powder, turmeric powder, garam masala and salt for 10 minutes and fry it in the hot oil and keep it aside. Heat ghee in a pressure cooker and add chopped onions and saute well. Add chopped tomato and saute. Then add cloves, cinnamon, cardamon and pepper powder and mix well. 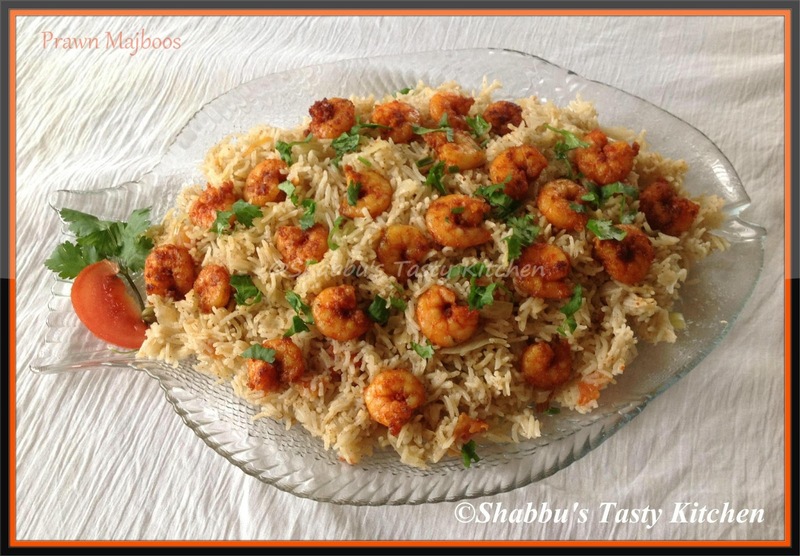 Add 1 cup drained basmati rice, 1 1/2 cup water, ground prawns,dried lemon and salt and mix well. Omg, wish i live near to u to enjoy this droolworthy dish.